It’s Rob Riggle’s turn to take his cuts in the batting cage at Royals camp. Only he’s not ready. While the next group of KC hitters paces around, Riggle’s standing off to the side, fiddling with his iPhone. You can forgive Riggle for wanting to share his excitement with the masses. The 41-year-old actor/comedian/Jon Stewart intimidator/21 Jump Street costar grew up in Overland Park, Kansas, just across the Missouri state line from Kansas City and Royals Stadium (now Kauffman Stadium). A die-hard KC fan who grew up with the great teams of the ’70s and ’80s (seven playoff berths in 10 years), Riggle got to live out a boyhood dream recently by taking hacks with the Royals. After a slow start, he got some hitting advice from Royals legend and Hall of Famer George Brett. On his next turn in the cage, he got into a few balls, driving a couple to the edge of the warning track in left-center. 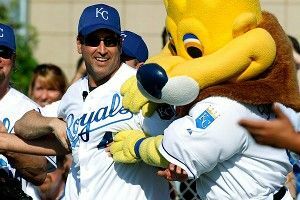 Riggle held court after taking his cuts, talking about his first trip to the ballpark, the value of scrubs on a winning team, and the title of Most Famous Royals Fan. What is your earliest memory of the Royals? What was it, third grade? Third grade I was in the Cub Scouts, and our whole den went to see the Royals. We sat way up in the nosebleeds and it didn’t matter because we were at a big league baseball game, my first one ever. I remember putting all this pressure on myself as a third-grader, going: “If the Royals lose tonight, I blame myself.” So I was desperate for them to win, because I wanted to think that I brought them good luck. They were really good in those years, too. So you actually just missed two of the most traumatic Royals experiences of all time: Chris Chambliss’s walk-off homer to end the 1976 ALCS, and the Royals blowing a two-run lead in the ninth inning of Game 5 in the ’77 ALCS. I’m glad I missed that! And then three years after my game, we got to the World Series. We lost, to the Phillies. Which didn’t sit well. But we were very competitive then. And then in ’85 we won, and I was at Game 6. I’ll never forget it. I know a lot of people from St. Louis claim it was a bad call. I don’t know, guys. I was at the game. It looked right to me, from where I was sittin’. Of course I was on the third-base line. But it looked right to me. That ’85 World Series team was weird too. You had a whole bunch of mediocre players there — Darryl Motley, Buddy Biancalana, Onix Concepcion. These guys were getting playing time. This wasn’t an All-Star team at all. What happened there? Teams that win championships, you don’t necessarily need a dream team. You need a bunch of guys who play well together. I’ll take that any day over a bunch of All-Stars. My Grantland colleague Rany Jazayerli, who’s a Royals fanatic, had a question for you: Do you think George Brett was really going to slug umpire Tim McClelland after the pine tar incident? Or do you think he was just posing, just saying, “Hold me back, guys!” when he had no intention of doing anything? I think when he came out of that dugout, he was about as red hot as a human could be. After they got a hold of him, who knows. But on the way out there? I wouldn’t have wanted to be in his path. Right, Jason Sudeikis. But then, on my end, there are Bill James, Rob Neyer. You’ve got these big-time writers and stat heads who are true-blue Royals fans too. Do you have aspirations for the throne? Because someone’s got to emerge here. Let’s just say we’re all brothers in blue. There’s no pecking order, no status here. We all sit in left field and drink beer and eat peanuts together and root for the Royals. The fact that they let me hang out with them and take a few cuts is one of the coolest things on Earth. I’m floating right now, because I just got to take batting practice with a major league baseball team. My favorite team. It can’t get much better than that. You’ve got 21 Jump Street coming out, where you have to do actual acting. With The Lorax, you just show up in a studio and do a V.O. That’s the sweetest job in the world, right? Well, you do have to deliver a vocal performance. You do have to emote, you do have to do all these things with your voice. Which can be tricky, because you’re not acting with anybody. You’re just doing it into space. So you have to react off of very little. So there’s a little craft to it. But you’re right, I’ll take that kind of work any time I can get it. Roll out of bed, throw on a hat, no shave. Roll down in my flip flops, knock out a day’s work. It is the sweetest job in the world. I can’t even front on that one.